Residents of Beaverton know they are in the right place. Our city is a great place to live, work, and raise a family. We certainly couldn’t get where we are today without investing in the city we call home. The $150 million Urban Renewal Plan provides infrastructure support such as streets, roadway improvements, parking, sidewalks, utilities, and public spaces. These upgrades provide incentives to attract business and housing, address traffic flow and public safety, and support private investment in the area. We also continue to invest in internationally-focused events like the Beaverton Night Market located at The Round, across from City Hall. 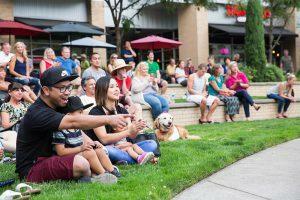 Over 13,000 people per year have attended the culturally-relevant market which features ethnic food and crafts for families of all backgrounds in Beaverton. While enjoying everything that the market has to offer on Saturday, Aug. 11, be sure to take a look around. Beaverton Central has seen a great deal of activity recently, including work on The Rise, a mixed-use development featuring 230 housing units, a hotel, and a restaurant. Fundraising also continues for the Patricia Reser Center for the Arts, a regional draw that will be located in Beaverton Central. Eighty percent of the funding needed for the construction of the center has been identified, including a $13 million gift by Pat Reser made possible through the Reser Family Foundation. Arlene Schnitzer and Jordan Schnitzer have also donated $1 million through the Harold & Arlene Schnitzer CARE Foundation. A campaign to secure the remaining private capital needs is underway. Beaverton Central also recently celebrated the opening of BG Food Cartel, a food cart pod featuring an assortment of food and beverage choices. Brick and mortar businesses also continue to find success in Beaverton. In the last three years, 29 downtown businesses have been part of the storefront improvement program and 18 restaurants have received interior improvements. Downtown will also welcome eight new restaurants including Big’s Chicken, Ex Novo Brewing, and more. From infrastructure improvements to restaurants to art to events, Beaverton’s future continues to look exciting and bright. To learn more about Beaverton’s neighborhoods, involvement opportunities, and the matching grant program and more, visit www.BeavertonOregon.gov/neighborhood. PreviousBeaverton Real Estate: Aging in place or move? Beaverton Education Foundation: BEF Phone-a-thon Turns 18!